This non-fiction text does not attempt to convert readers to Christianity. Instead, it reminds readers that to know God, one only has to listen for His Still, Small Voice. Television personality Lisa Mason returns to her journalistic roots to chronicle the way God speaks to us. Combining present-day observations with stories of the past, her tale takes readers on an honest, sometimes heartbreaking, journey. From witnessing the ravages of HIV on the human body, to accepting an EMMY award, to experiencing the shock of the Oklahoma City bombing, this non-fiction text does not attempt to convert readers to Christianity, nor is it filled with scripture. It does, however, remind readers that to know God, one only has to listen for His Still, Small Voice. I was surprised at the honesty of this book. Especially at her own expense. I don't know what I expected, since she is a new writer, but I was truly pleased with the stories. I truly appreciated and related to the stories she recanted of her past, present & future. Lisa has a very eloquent style of writing that makes this book captivating and easy to read. Highly recommended - A true testament to the power of faith, hope & love. From the minute you start reading you won't want to put it down. Written with sincerity, it will make you smile, laugh, and cry within an hour. You will relate your own experiences to the life lessons of Lisa. A down to earth well written book worth reading. This is a poignant and compelling little book that gives insight into what we can learn on our life's journey if we will only listen to what God wants us to hear. No preaching, no attempts at conversion to the author's religion, only the promise that God is always working in our lives. We can choose to ignore Him or we can listen and learn, as the author has, from both our successes and our failures. Her stories are very real and the lessons in each are powerful and universal. Great little book by a talented new author. Highly recommend! I was very pleasantly surprised by Lisa's book. Her life stories are ones that we can all relate to in one way or another and the "life lessons" are not preachy or pedantic. Reading her book felt like sitting down on the porch swing, glass of lemonade in hand while talking with a respected and well loved friend. Bravo, Lisa!! I really enjoyed this little book. By sharing her stories, Lisa reminded me that "we" are really not that much different from one another AND it is through "our" strength combined with God's grace that the past is shed thereby making room for the future. Bite by bite, chapter by chapter, this book nourishes and satisfies. Ms Mason is open, honest and vulnerable as she shares experiences and the profound truths we can learn from them when we stop, look and listen. These life lessons are the very stuff that brings meaning and beauty to life. I felt invited to discern my own lessons or remember my own experiences which point to the truth of the life lessons Ms Mason articulated. Reading the book was a lovely experience. An Amazing book by a wonderful and talented human being. Who took a leap of faith in publishing this incredible book and in the process has touched many lives including mine. I so appreciate your honesty, vulnerability and sharing with all of us who cherish you!! You are a true gift from God !!! I am enamored at the truth in Lisa's words and the introduction moved me so that I cried. We are the same age and her "Life Lessons" all struck home with me. Her book flowed so beautifully and I found that pictures were not necessary because of her magnificent narrative descriptions. The thing I liked most about her book is that it was not filled with fluff. Countless times I have been so bored by books where the author does not adequately get to the point and he/she believes that a certain number of pages must be filled for whatever their reasons may be. I believe in quality over quantity any day. Lisa Mason is an example of God’s greatness. This book of Lisa's and the Bible are the richest books I’ve ever read. This is a truly wonderful book that really encourages you to push through the challenges of life and reflect upon not only the good, but also the difficult times in order to learn and grow as a person. It is very well written and Lisa really brings you into her life in a personal way while making you laugh and at times shed a tear. Everyone is on a journey in life and for me, as a Christian, I do believe that the Lord speaks to us and guides us along our paths. I could not put this book down. i cried and laughed, and loved the lesson that were woven throughout each story. this book touched my heart and soul, and is one that will be with me forever, to read over and over again. I received your book about a week ago, I am not much of a reader, busy working single Mom, but I was feeling sad last Saturday, and I started reading your book and could not put it down, I laughed and cried and was sad and happy . It was an easy read, and I really enjoyed it, I have shared it with my Mom.Thanks for helping me to see God's life lessons in my life and to count my blessings. I absoultly loved this little book. It is a book you can pick up and read whatever chapter you might be interested in. Such an honest writer and great inspiration. Would highly recommend. I loved this book. Sometimes we need to be reminded of the principles that the author of this book brings to light. I read this book in one afternoon. Lisa writes like she's right there telling you the story. Great descriptions in the small details! written very nicely by a wonderful woman whom i admire. her stories were captivating. i found that i enjoyed the book so much,that it left me wanting to read more. i hope she will have a part 2!!!! I was so down when I got her book.. just found out that my grandson had been in some trouble and it was heartbreaking. I read Lisa's book and it was so uplifiting and just showed me that we all have had struggles in our lives and have gone on to achieve good things at some later time. It was very encouraging for me and I appreciate her book and may read many times..Thank You! 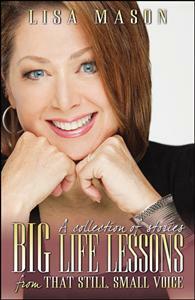 Lisa's book is a recollection of memories full of life lessons we can all relate to. Having the pleasure of knowing her family, Lisa's Dad, Mom, Missy, Amanda (Mandy to us) and the boys - her life stories are humble and revealing yet peppered with humor and sage wisdom on life experiences and a deeper meaning of how we are all connected. God bless you Lisa Mason ~ Good luck with your journey and enjoy the ride! I could not put "Life Lessons" down until the last page was read! You explained so well that God's lessons and blessings are so much a part of our daily lives. Knowing your family has touched my life and having read your book, I know you also live daily with faith, hope and love. Lisa, may God bless you with many more heartwarming experiences to share.